Bodouin Lombelejale, 43 and a father of 12, is especially pessimistic that his vote might improve his daily life. "Once the candidates are elected, we will never see them again and nothing will change here," he said. "We want to see something today." Almost 10 years after a rebel movement overturned the 32-year rule of President Mobutu Sese Seko, the people of the DRC finally have a chance to democratically elect their president plus 500 members of parliament. But, in early June, nobody in Yasira knew the date of the elections, which, after many delays and postponements, are scheduled to be held on 30 July. Here in the interior of the humid Congo Basin, news travels slowly. From the air, you glimpse roads that opened up this huge country for colonisers from Belgium, now swallowed by nature and disappearing into an endless forest. The challenges in holding free and fair elections in this vast and anarchic country are tremendous. Yasira market in Isangi Territory is the largest trading venue for a population of 500,000 people. It takes several days to reach Isangi by dugout canoe, or pirogue, from Kisangani, capital of Oriental Province in northeastern DRC, some 1000 km from the nation's capital, Kinshasa. News travels slowly on the Congo River. 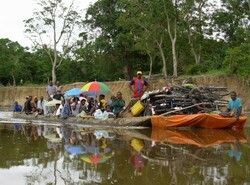 A pirogue makes its way to Kisangani. Propelled by an outboard engine, the canoe trip on the Congo and Lomami Rivers, passes dense secondary forest, abandoned oil palm plantations, a collapsing agricultural institute and the skeleton of a derelict sugarcane factory. Flying high in almost every village along the river are yellow flags with the insignia of the Parti du peuple pour la reconstruction et le developpement (PPRD) - the political party of President Joseph Kabila, who came in to power January 2001, inheriting the post from his father, Laurent-Desire Kabila, leader of a rebel movement that ousted Mobutu. There are hardly any colours flying for any of the other candidates contesting the election. It looks as if Oriental Province is a sure thing for the young and incumbent president. Almost every observer IRIN encountered said the same thing: "Kabila has the money, so he will win." At Yasira market, a vendor sells unlicensed drugs; others offer smoked fish, bananas and cassava cake wrapped in leaves. Aside from petty trade, the economy is at a virtual standstill. The electorate here, as in other villages throughout the impoverished heart of the Congo, is needy: "We want money, beer or T-shirts," one voter said. In Kisangani, people walked around in T-shirts emblazoned with the images and names of candidates a month before the official start of campaigning. "In all this misery, you can buy a poor man with a piece of soap," said Sister Marie Madeleine Bofoe, head of the Catholic NGO Caritas in Isangi. Neglect and decline. 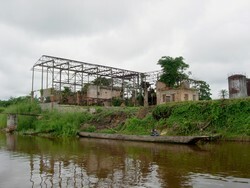 A dilapidated sugarcane factory on the Congo River. This also illustrates a paradox: an election to end despotism is making an entire society gamble with its future. "We don't know any of the candidates, and we have no idea who to vote for," said Bebale Bombole, a fish vendor. With more than 9,600 parliamentary candidates and a campaign period limited to one month, many voters will not be able to make an informed decision. Information reaches the population through radio, but at Yasira market, there have been no batteries on sale for at least a month. Hence, there was no information for the electorate. The price of batteries is out of reach for most; a set costs 200 Congolese francs (US$ 0.47), about the same as a month's worth of school fees. During his presidency, Mobutu looted state coffers, spending the national budget on private yachts, planes and a lavish lifestyle in expensive hotels the world over. When the senior Kabila marched into Kinshasa, people hoped for change. The fear now is that history is repeating itself. Corruption is rife in the DRC. In a recent scandal, $4 million - almost half the country's official budget for doctors and hospitals - went missing from the Ministry of Health. The money had been set aside under a debt-relief scheme for some of the world's poorest countries. An administrator in Isangi town does not deny the governance problems his country faces: "We have no political culture, and elections are a new thing to us. People have no basis to make value judgements, and candidates who distribute presents will have it easy, cheating others." 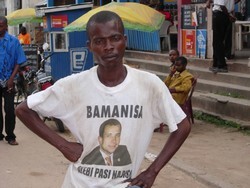 A member of the electorate wears a free T-shirt from a candidate in Kisangani. When the administrator was appointed by the transitional government a year ago, he inherited an office run by people who had not been paid a salary in years. Forget computers; there was no typewriter or paper. With a start-up budget of $3,000 from the provincial governor, the administrator bought a pirogue with an engine to start a business that would finance his office. He also plans to buy a chainsaw to cut down forest trees to sell to help his salary and that of other government employees. "You have to help yourself in this country," he shrugged unhappily. "It's called auto-financing." Practically everything in the DRC now operates in this manner - public schools, hospitals and even some Catholic missions, which rent rooms to aid workers and journalists to make ends meet. Auto-financing at higher levels opens the door for large-scale plunder. "We have to admit our problems; we collect taxes and put them in our pockets, that's why there are no services," the administrator said. "I wish they would come here to check my books, but for this, they have to give me money [to check] first." Whatever taxes were collected at one time in Isangi, were never reinvested. The schools are made of mud, the hospital is decrepit, the roads petering out, and there is no electricity. But not everything is bleak and hopeless in the interior, to which the United Nations Peacekeeping Mission in DRC (MONUC) is currently shipping thousands of ballot boxes by helicopter for millions of voters. A significant number of the voters are illiterate, and though women make up more than half the population, only three dozen are registered as candidates nationwide. 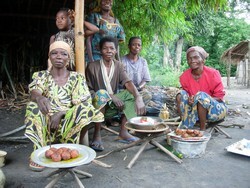 Illiteracy among women in the Congo is more than 60 percent. During a referendum for the new constitution in 2005, the population came running to get voter-registration certificates - the first and only identity card many people had ever received. The certificates are now an accepted proof of identity at checkpoints along the rivers, which are manned by Kabila's black-clad presidential guards. "The exact estimation of how many potential voters there are is highly political, and therefore strictly confidential," demographer Andre Lambert, from the Catholic University de Louvain in Belgium, told IRIN. "I am forbidden to give you the number I extrapolated." Women selling food at Yasira Market. Many people have no idea of the polling date. Lambert worked on a study financed by the European Commission to determine how many people live in the DRC, estimated elsewhere at about 60 million. "Some politicians would like to blow up ethnic percentages for an electorate that often votes along ethnic lines," he said. And candidates know that. Blaise Baise, who was born in Isangi, is running for one of five parliamentary seats in Kisangani. He is currently a member of the transitional parliament, serving on its commission on politics, administration and justice. He was appointed to parliament because of his work for a Catholic nongovernmental organisation, Paix Christi International, which mediated between feuding ethnic groups in Kisangani in the mid-1990s. "Voting for one's ethnic group will be the biggest factor in the elections, money the second," said Baise, a member of the local majority Matoke community. "Already some tribal chiefs have received bicycles from candidates. For $100 you can buy the chief of a tribe." Baise's parliamentary seat pays him the equivalent of $1,200 a month. He just used some of his salary to print 50,000 pamphlets with his name and face on. His power base is youth groups, which he said appreciated that he stood his ground in Kisangani during its tumultuous period. However, youth groups being influenced by different forces. Other candidates gave them footballs. The youth groups can be brutal power players if they are discontented and angry. In Kisangani, three gangs associated with political parties fought against each other, beating up candidates from other sides. As the election day draws nearer, the heat in the garbage-strewn city, is likely to rise. There may be numerous political parties backing candidates in the upcoming elections, but one single force is likely to be more influential than the rest: the Catholic Church. "You must be endorsed by the priests in order to win," Baise said, who is working hard at winning their favour. The representatives of the church play their cards carefully. "They all would like our support, but no one is endorsed yet," said Father Badidique, head of Caritas in Kisangani. Caritas is the largest development agency in Oriental Province. A powerful provider of information. Volunteers broadcast election guidance over Catholic radio station Bondeleo. Most of the church, however, is not in wait-and-see mode. It actively participates in the election process. In Isangi town, a young priest, Jean-Noel Mbola and 15 volunteers run the Catholic radio station Radio Bondeleo [peace and justice], which broadcasts through a 1,000-watt transmitter funded by an Italian diocese. 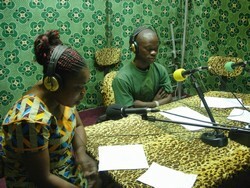 The programme: news, music and "information on what kind of a Congo we want," Mbola said. In Kinshasa, church radio broadcasts profiles of candidates, and priests openly call out names when they say Mass, reminding their flock of who they say participated in atrocities in the DRC, who may be notorious for corruption and otherwise a danger to society. As campaigning officially starts, Radio Bondeleo will mention names as well: "Candidates have to have a positive past, a project that helped the community," Mbola said. This policy endorses people associated with the Church, often the only ones doing humanitarian work. "Now the sons from Isangi who left to study, come back to slice up the cake," Mbola said, "but I don't think there are enough people who really mean good." In May, Congolese Cardinal Frederic Etsou sanctioned the marriage of President Joseph Kabila, a non-Catholic, an act widely perceived as a sign of endorsement of his candidacy. Bernard Etukolombo was a teacher of sociology at the University in Kisangani and development agent for the Catholic Church. He now heads the Independent Electoral Commission for Isangi and two other territories with almost 600 polling venues in all. Etukolombo will have the difficult task of running the elections here and making sure that every voter knows what he is doing. He told IRIN he believed that only one-third of the local population knew what the upcoming elections were all about. "No problems? We got nothing but problems!" he said. "The road conditions are terrible. Sometimes even motorcycles cannot pass. Then, our people have to visit the villages on foot." Voting kits for the 2005 referendum on Congo's new Constitution, weighed 50kg each and sometimes had to be carried on porters' heads. Etukolombo's staff of 12 people had not received a salary for three months. They have no insurance, and when they fall ill they get little or no help. In the course of his work, Etukolombo himself has had a motorbike accident. On the day that dozens of ballot boxes arrived in Isangi by MONUC helicopter, Etukolombo was still waiting for money to buy petrol for the two jeeps and 10 motorcycles that would be used to distribute ballots to voting venues. Time was running out for him. "There is real danger that people will vote with open hands," he said.